We've been systematically ignoring NBC's "Olympic Late Night" coverage, mostly because by the time it airs the events it covers are a day old and, at the same time, there is actual live Olympics competition happening. Maybe we should be watching it more closely. Tonight Mary Carillo (who is awesome) and Bob Costas (who is diseased) shared a drink of vodka with each other, and it was just delightful. Carillo's package on vodka production in Russia had just aired, and Costas came prepared with two glasses full of swill for when they returned. We have no idea what he meant by "they never drink it distilled," because vodka by definition is distilled. 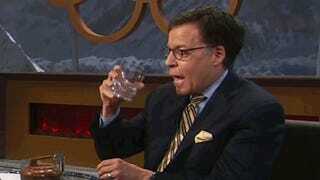 We're very curious if Bob Costas got carded when he tried to buy this vodka. Maybe he got the booze from Al Michaels.